Thursday August 3, 2017: Michael finds a clue to Sonny's whereabouts, Sam struggles to remember, Valentin visits Ava, and Jason demands answers from Garvey. Kevin and Laura sit outside of Kelly’s and discuss the ordeal Spencer had been through. Laura is worried about his anger towards Valentin and that he’s starting to think like a Cassadine. Inside, Bobbie gets Carly some coffee and they discuss the search for Sonny. Later, Carly heads back out to look for him. At Wyndemere, Valentin is shocked to find Spencer sitting at the desk in the living room. Spencer explains he’s establishing residency as part of his civil suit against him, and if he tries to throw him out he’ll charge him with assault. Valentin knows another way to get rid of him, and calls Laura. Laura and Kevin arrive, and Kevin takes Spencer out to the launch while Laura has words with Valentin. She warns him that Spencer’s suit won’t go away, and Spencer will have the satisfaction of hearing Ava tell the world that he murdered Nikolas. At GH, Sam sees Garvey being wheeled through the hall and becomes troubled because she knows him somehow. Alexis arrives to visit Sam, and helps her back to her room. Alexis can tell something is upsetting Sam. Sam admits she feels she is not remembering something important. Alexis thinks it can wait because she needs to rest. She leaves to get the nurse, and Sam begins to remember her argument with Sonny. Elsewhere, the cop guarding Garvey’s room is called away on an emergency, and Jason sneaks in to see Garvey. He demands he tell him where Sonny is. Garvey admits he didn’t kill Sonny, she did, and then codes before he can say more. Meanwhile, Julian returns to the hospital to see Sam, but runs into Alexis who believes his presence won’t help. Julian disregards Alexis and goes to check on Sam. Sam suddenly remembers meeting her father about getting rid of Sonny. He says it must have been a hallucination because they never talked about Sonny. Alexis returns and is angry that Julian didn’t listen to her. She asks Julian what he’s doing, and he claims he’s protecting their daughter. At Nelle’s, Nelle and Michael tell Joss that her necklace is made out of a bullet casing. Michael asks where she got it, and she explains she and Oscar found it at the old distillery construction site. Michael decides to report the gunfire to the cops, but Joss says the bullet may have been there for years. Nelle examines the casing and says it was fired recently. Carly shows up looking for Michael, and informs him that the police believe Garvey took his dad to some isolated structure somewhere and asks if he can think of anyplace. 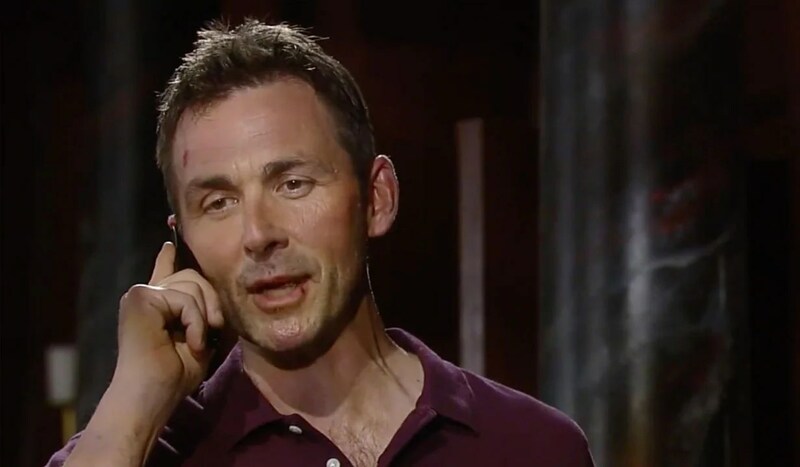 Michael realizes Sonny may be at the distillery, so Carly asks him to call Dante with the tip and rushes off to the site. Later, Michael mentions to Nelle that he didn’t know she knew so much about firearms, and there is still so much he doesn’t know about her. Sonny lays unconscious at the construction site after climbing out of the pit. Over the loudspeaker comes the announcement to clear out because the site will be blown up in twenty minutes. He struggles to escape as the countdown hits the ten-minute mark, but passes out. Carly arrives and finds him as the countdown reaches thirty seconds, and Sonny comes to and orders her to leave him because he can’t move. She refuses and tries to help him escape as the countdown reaches one. Laura and Kevin return to Kelly’s with Spencer and lecture him about what he did. He apologizes, but Laura tells him that they are going to have a talk about his future in Port Charles when they return home. Ava asks Valentin what he has to offer her. Laura informs Spencer of her decision. Sam is unsure what she dreamt was a dream. Jason asks Garvey to wake up and tell him who shot Sonny. Dante warns the construction crew that people are on the site.